In a novel that reunites the beloved characters of Sister of My Heart, Chitra Banerjee Divakaruni explores the emotional ties between two lifelong friendsand how they change when the husband of one is dangerously attracted to the other. The Vine of Desire continues the story of Anju and Sudha, the two young women at the center of Divakarunis bestselling novel Sister of My Heart. Far from Calcutta, the city of their childhood, and after years of living separate lives, Anju and Sudha rekindle their friendship in America. The deep-seated love they feel for each other provides the support each of them needs. It gives Anju the strength to pick up the pieces of her life after a miscarriage, and Sudha the confidence to make a life for herself and her baby daughter, Dayitawithout her husband. The womens bond is shaken to the core when they must confront the deeply passionate feelings that Anjus husband has for Sudha. Meanwhile, the unlikely relationships they form with men and women in the world outside the immigrant Indian community as well as with their families in India profoundly transform them, forcing them to question the central assumptions of their lives. "An engrossing and satisfying novel." "Divakaruni is gifted with dramatic inventiveness [and] lyric, sensual language. . . . 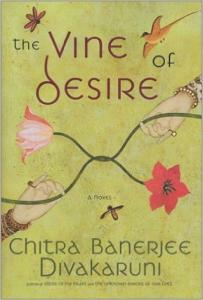 The Vine of Desire offers many delights." "Divakaruni is an incomparable storyteller. . . . the beauty of her talent is her ability to capture the true complexity of the emotional landscape in her characters. . . . A lovely read." "Incandescent. . . . Abounds with vibrant images." "Grab The Vine of Desire. Divakaruni is a transplanted cultural treasure [and] a brilliant storyteller." "As gracefully structured as a piece of chamber music." "Chitra Banerjee Divakaruni fills a space all her own. . . . Her fiction draws a line straight to the heart." "Divakaruni. . . . paints worlds of complex characters and cultures with an absorbing story line and beautiful language that reads like poetry." "Provid[es] with graceful economy a complex backdrop of contemporary Indian society." "Dazzling and powerful. . . . Divakarunis descriptions, as always, possess a fine lyrical beauty. . . . Readers . . . will have much to feast on." "Moving, passionate. . . . A beautiful, imperfect journey, much like life itself, and one well worth taking." "[An] exquisitely rendered tale of passion, jealousy, and redemption. . . . Divakaruni combines a gift for absorbing narrative with the artistry of a painter." "A potent, emotional book delivered by a writer who knows when to step back and take in the poetry. Book Compelling. . . . Divakaruni writes prose that is lush. . . . [She] excels at depicting the nuances of the immigrant experience."